This tutorial is all one would need to do beads & knitting. The new ideas about guitar string, etc. are great! Thanks. An excellent summary, as usual, ms fleegle. Thank you. Awesome idea! Thanks for sharing...it will be easy for me when I do my first bead project this summer. Off to the guitar shop now! I'm surrounded by musicians so this is a great idea. I've got to ask, though, you suggest 11 gauge wire but the picture shows 14 gauge wire - which is best??? 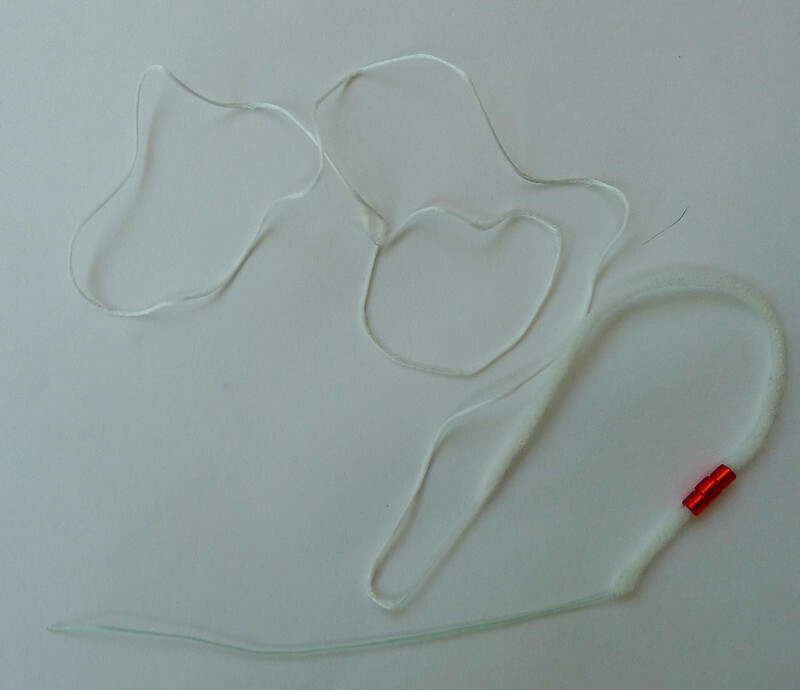 I've been using the dental floss threader which, BTW, can be bent to hold onto the stitches. But I'm interested in your guitar string method. I've never heard of a bead spinner before. Which kind do you use and how do you work it with the guitar string? Thank you for this interesting blog. 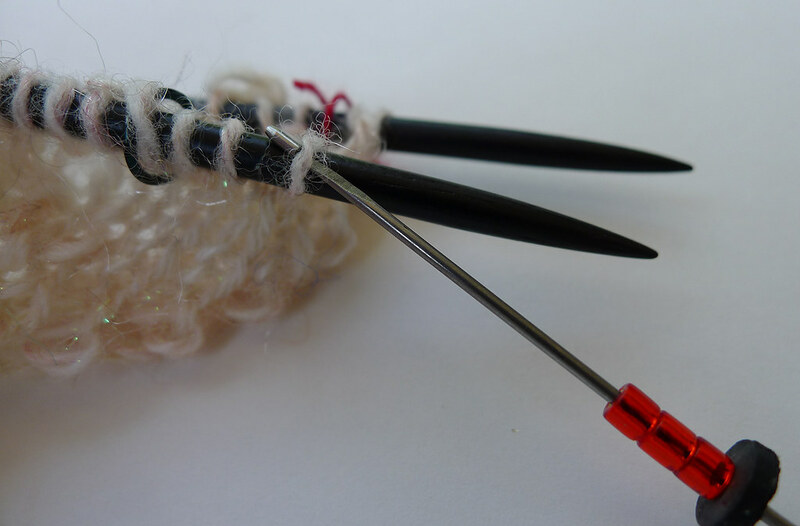 I use beads on my knitting quite a lot and use Floss but I use a sewing needle at the end. The guitar string sounds a good way, I think I will give it a go. 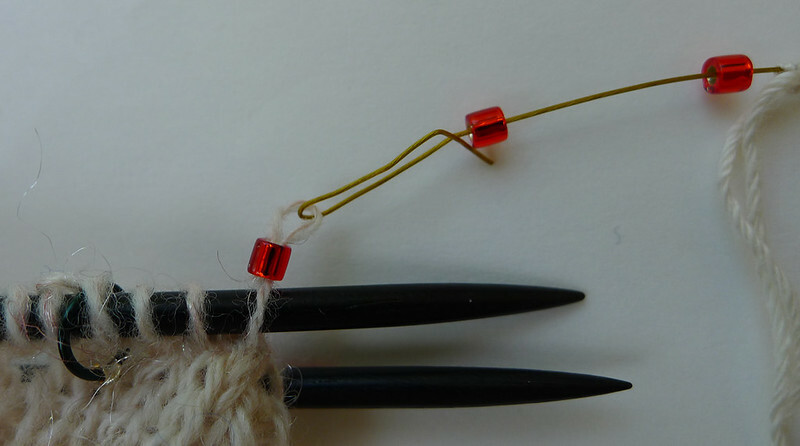 I use a flexible eye beading needle, bent into a U shape with off set ends. 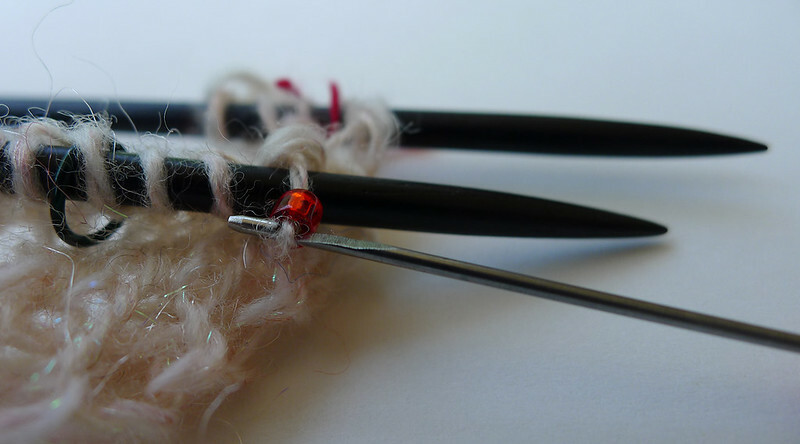 Use the eye to go through the loop of the stitch and slide the bead down the needle onto the yarn. 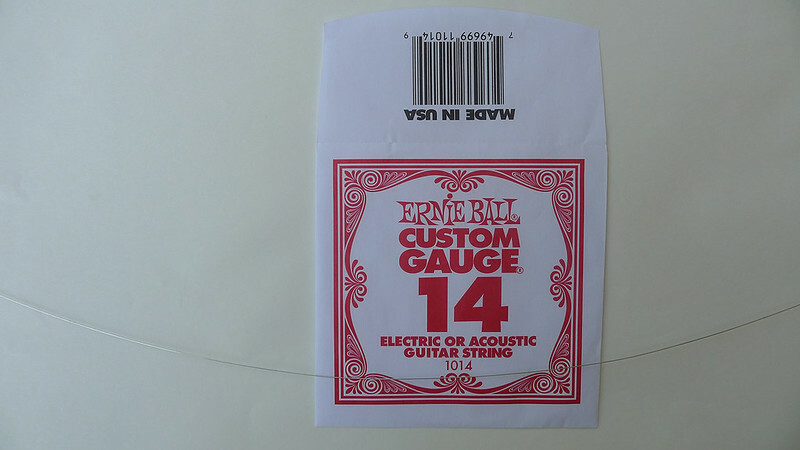 The guitar wire is a great idea and I have a few old violin strings laying around I think I'll look for. Once again you have invented an idea that will make my life easier and happier, proving that you well deserve my title for you of genius. 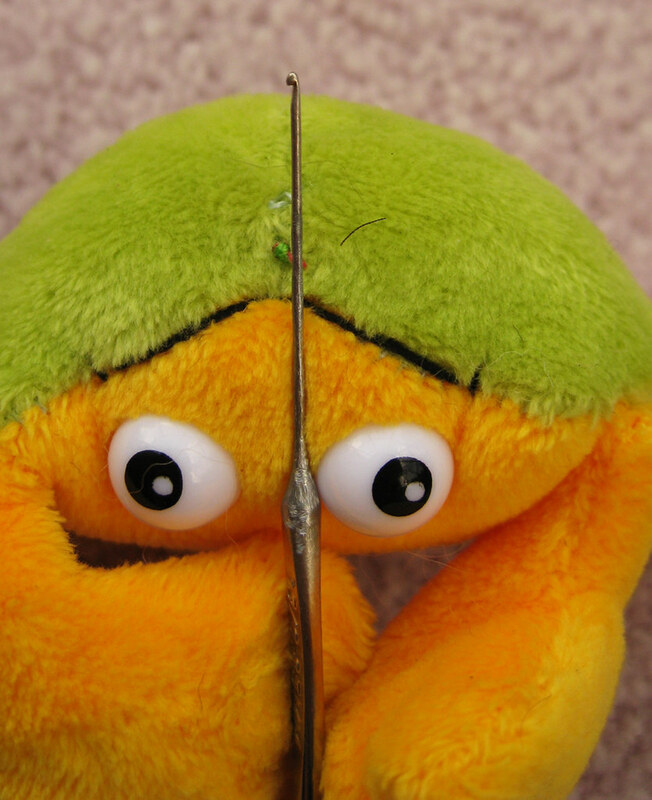 You are the MacGyver of beading hook tools. I love the guitar string contraption. Lots of thought went into this so I think you should name it The FleegleBeadle. Hee hee. I don't know why anyone beads with anything else! 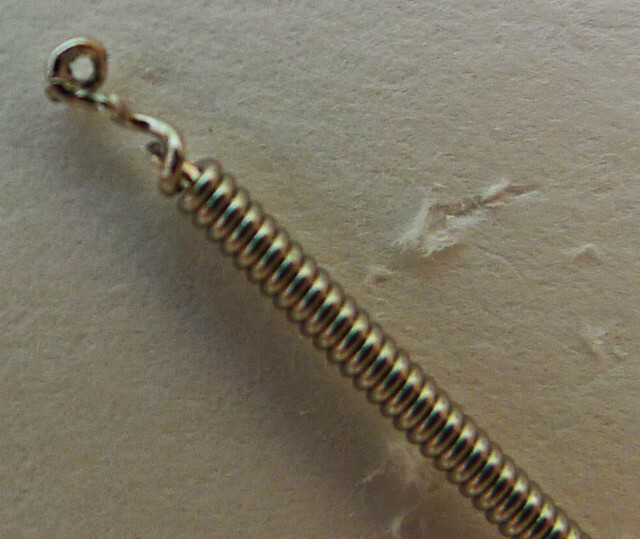 I am afraid I don't know the specific string I used, but it was spring steel, so disinclined to kink and very bendy. hmmm.... why don't you try filling something like a babyfood jar with sand and poking your crochet hook handle down into the sand to hold it? Then when you are not working, you can just put the lid on the jar. 1) You are as persistent as you are clever. 2) Your ideas seem to spark more ideas in your commentors -- making this tutorial a double whammy! I usually just stand the crochet hook up on the yarn ball as I'm knitting. Yes, you have to reload often. I have all of my beads in a tiny jar with a screw top (a cosmetics jar from when I was making face cream back in da day). As a troubleshooter, it was great reading this post. Thank you so much for the lovely tutorial and detailed pictures. I will definitely give this a try. 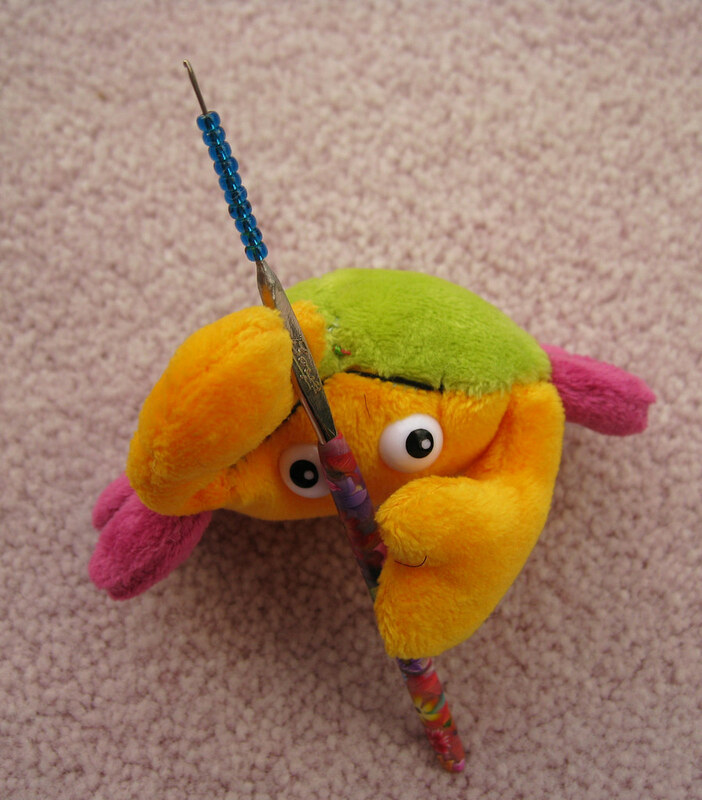 I keep breaking crochet hooks trying to get the tiny beads on and off of them. OMG, you are McGyver. McFleeger? McFlygle? 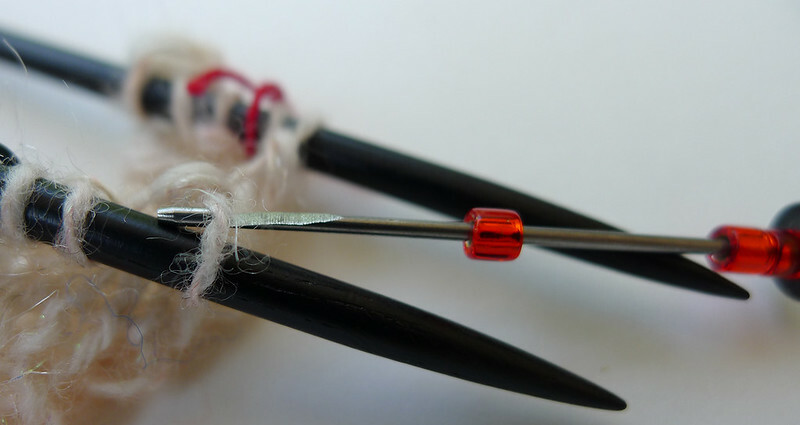 Excellent idea, but you missed one positive for the flossers....you just tie the softer end to a pin or openable stitch marker, and clip the floss to your knitting, and the fuzz keeps the beads in place. no need to unclip to thread on a new bead, either. Thanks for the wire suggestion, I'm going to have to experiment! Perfect timing! I'm about to start my first beaded shawl in earnest. I've just ordered a guitar string to try this, it was a lot cheaper than the floss! Guitar string sounds efficient. 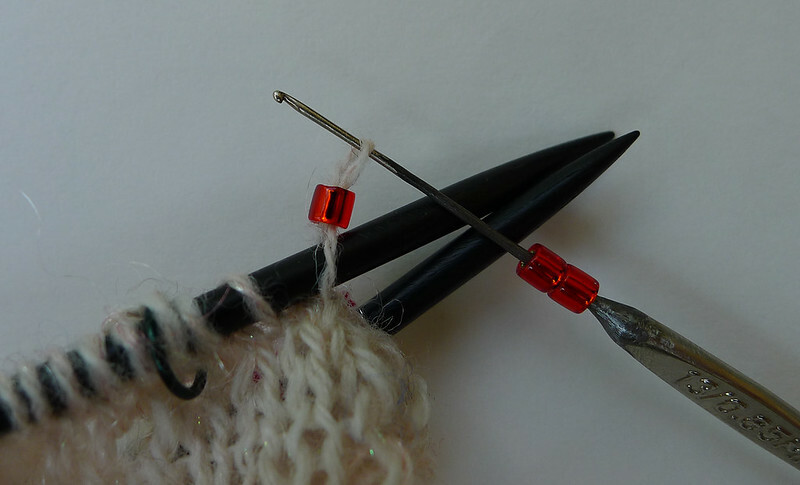 I have been using a tool like a latch-hook rug hooking tool but very tiny, from Sally beauty supply. I believe it is for the elaborate braided hair styles with beads. Your tutorials are great, as always. 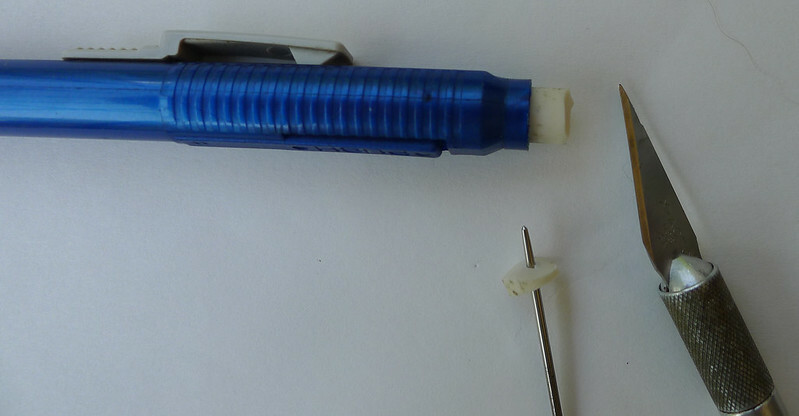 Rather than cutting off erasers, which tend to crumble after a while, you could use the foam or soft plastic earring stoppers the craft stores sell in their bead and jewelry departments. They stay on pretty firmly and the package I have says it contains 200 pieces so one pack would probably last a lifetime! another informative and hilarious post, though I do miss the surgical equipment that usually goes along with them. 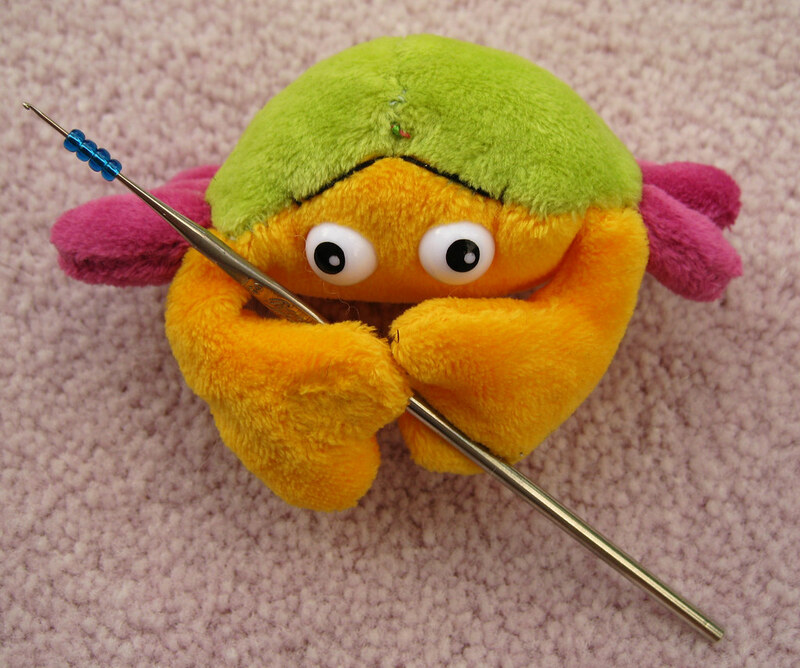 There is something called a "Big Eye" needle that bead stores carry and it's cheap; also a twisted wire needle that will fit through most beads. 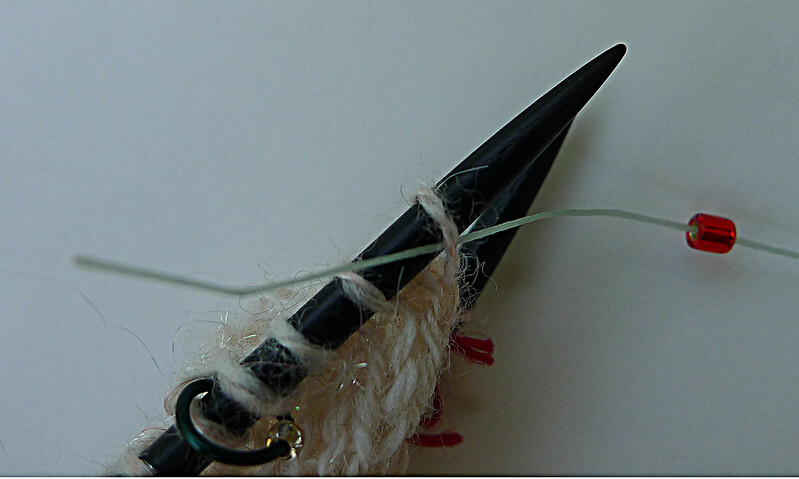 With both, you can slide about 18" worth of beads onto the yarn (or however much weight you can stand to deal with. Downside is that you have to break the yarn to string more beads on but I find it faster than applying with a crochet hook. 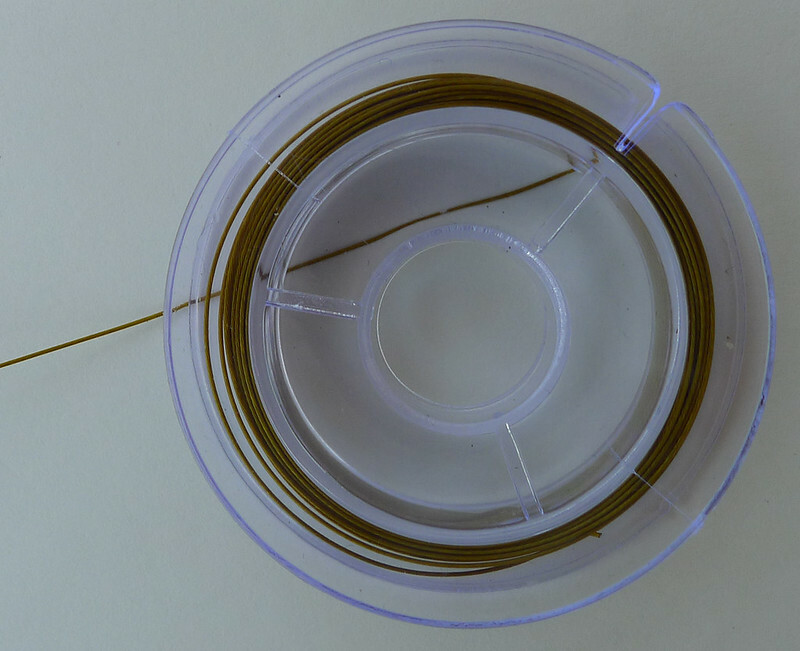 it's worth noting that there is design difference depending on whether a bead is sitting on top of a stitch or on the running thread between sts. 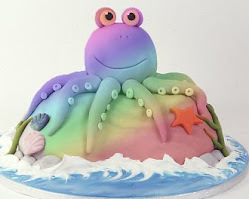 Quite interesting this blog post, sparkling new ideas indeed! 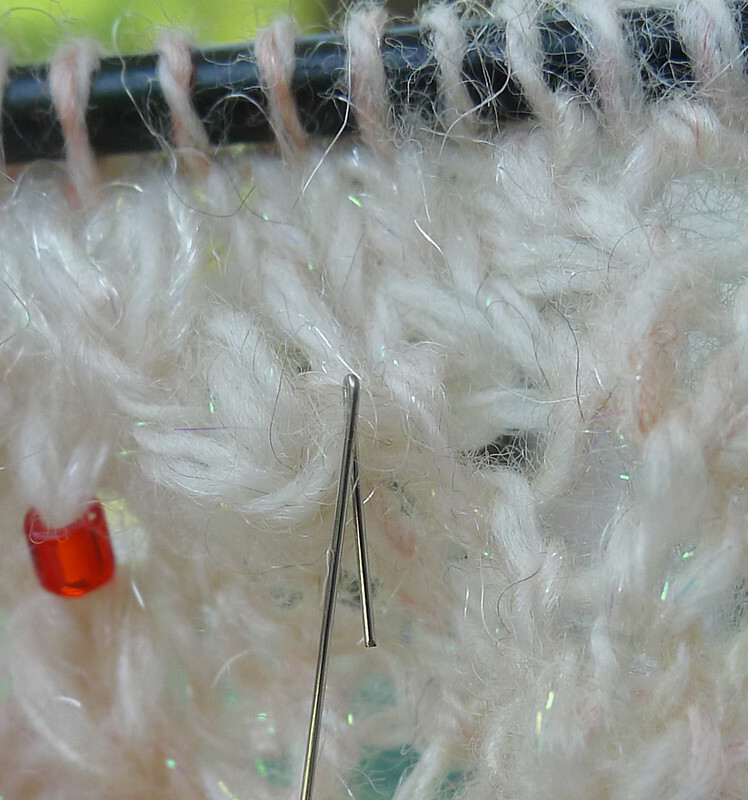 Thank you for your creative options for attaching beads to stitches. I too longed for a crochet hook with an elongated neck to hold more beads. I found a tool online called a cro-tat tool. 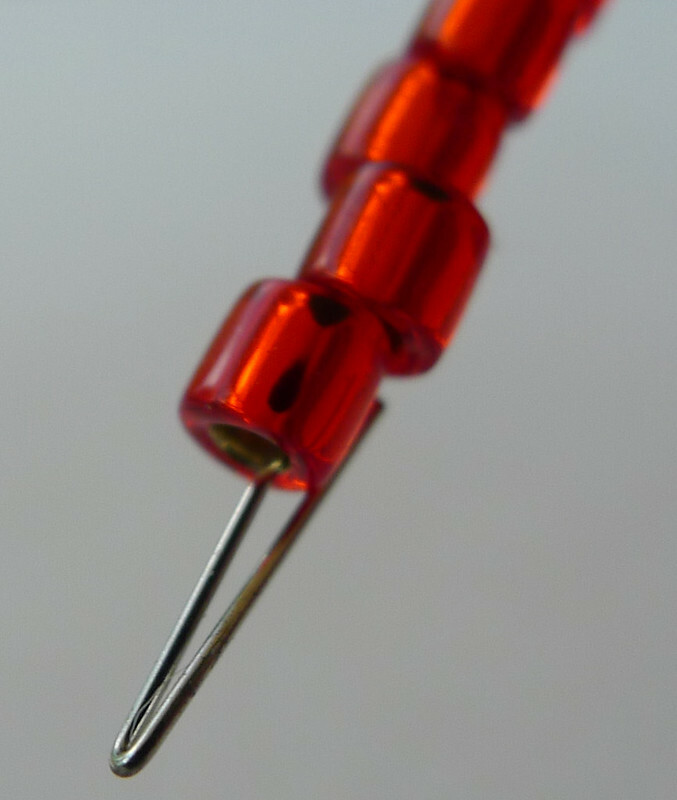 It is 1.0 mm and holds about 20-6/0 seed beads. There is a picture of here. Just scroll down to the last picture of the project. I had to order it from the UK at a website called Scarlet Dash. I am going to try your guitar strings too. Cheers!